Of late, home design professionals & clients are all bowing to the might of neutral colors when it comes to creating tasteful interior spaces. 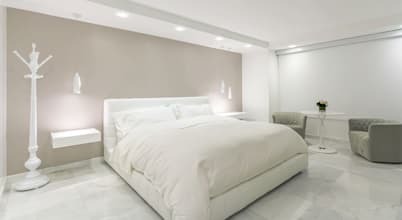 More often than not, room decorators & home-owners opt for honing in on the neutral look particularly for private spaces like the bedroom & the family room. Time & again, neutral colors have successfully proven that simple can be extremely sassy and that muted, sober tones need not always mean compromising on the style quotient. Whatever be the style of interiors – classic, modern or Mediterranean- the smart usage of neutral hues can transform a plain room into a tranquil haven of elegance. The bedroom is often the space that is oftentimes overlooked during styling, since it is mostly out of public view. However, it must be the exact opposite since the bedroom is the place where we refresh ourselves & recharge our batteries after a hectic day at work. It follows that the bedroom be so bedecked as to facilitate a restful ambiance, and the color palette is a key element to accomplish the same. This homify story is all about how the inspiringly jazzy neutral color scheme creates a visually appealing sanctum of absolute repose sans skimping on modishness. Join us as we get up, close & personal with 7 wonderful neutral color palettes for the bedroom, and draw ample inspiration from this treasure trove of ideas to take home!